Whisk eggs, milk, salt, and black pepper together in a bowl. Spray a 2-quart baking dish with cooking spray. Spread bread pieces out in an even layer on the bottom of the prepared dish; top with sausage, Monterey Jack cheese, egg mixture, and Cheddar cheese, respectively. Cover the baking dish with plastic wrap and refrigerate, 8 hours to overnight. Preheat oven to 325 degrees F (165 degrees C). Remove casserole from refrigerator and let sit at room temperature for 15 minutes. 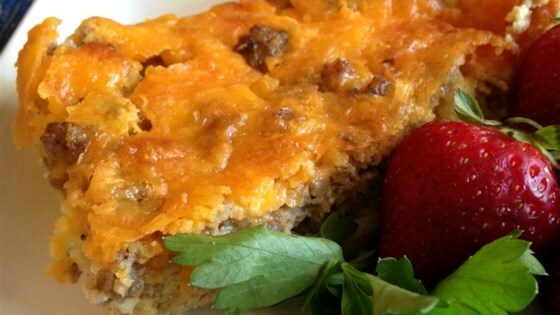 Bake casserole in the preheated oven until bubbling and hot throughout, about 45 minutes. Just okay. Probably won't make it again. Easy and delicious! Followed the recipe as written and it was awesome for Christmas morning. The only thing I might change is to reduce or eliminate the salt. GREAT ONE LORI! Easy to put together the night before. The family loved it. I used pre cooked turkey sausage crumbles to cut back on fat. Turned out great, next time I make it I will add some onion, red bell pepper and maybe some green Chile.